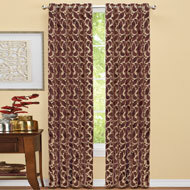 This curtain has a woven leaf pattern throughout with a lighter background color and is available in two colors and sizes. 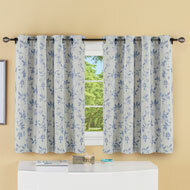 Perfect for smaller windows such as basements or bedrooms. Grommets at the top make hanging easy. Machine wash. Polyester; imported. Choose: Mocha or Blue. Available in: 45" Panel (45"L x 54"W) or 54" Panel (54" x 54"W). 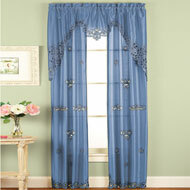 This beautiful sheer curtain panel features a solid color background embroidered with an elegant floral design. 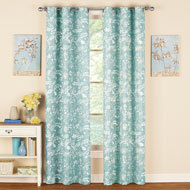 The lovely fabric lets light through while offering a bit of privacy. Rod pocket top. Panels sold individually. Machine wash. Polyester; imported. 84"L x 55"W. Choose: Cobalt, Crimson or Sage. 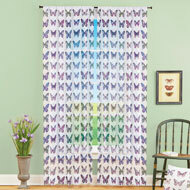 A beautiful way to frame your view, this lovely sheer curtain panel features colorful butterflies atop a white background. 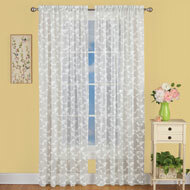 The semisheer fabric lets light in while providing privacy, and the rod pocket top makes hanging easy. Each panel sold individually. Machine washable polyester; imported. Available in: 63" Panel (63"L x 52"W) or 84" Panel (84"L x 52"W). Panels sold separately. 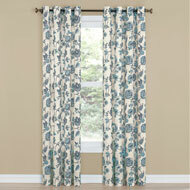 With a lovely floral design, this beautiful panel dresses your window with elegant style. Grommets at the top make handing easy. Machine wash. Sold individually. Polyester; imported. Specify Color: Garnet, Charcoal, Denim or Sand. 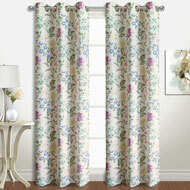 Available in 63"L x 52"W or 84"L x 52"W.
A beautiful floral design in gorgeous colors make this lovely curtain panel the perfect way to dress up your windows. 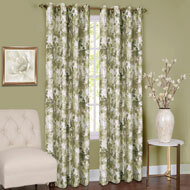 Three different color palettes let you choose a design that perfectly suits your décor.  The floral pattern appears atop an ivory background. Grommets at the top for easy hanging. Panels sold individually. Machine washable polyester; imported. Choose: Denim, Jewel or Linen. Available in: 63"L x 52"W or 84"L x 52"W.
With a woven Aztec design, this beautiful panel is available in two solid colors with a white pattern. Grommets at the top for easy hanging. Available in two lengths. Machine wash. Sold individually. Polyester; imported. Color available in Blue or Taupe. 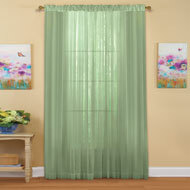 Size available in 52"W x 63"L or 52"W x 84"L.
These distinctive sheer curtain panels feature a beautiful ombre pattern that will instantly enhance any décor. 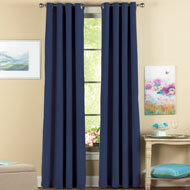 The sheer panel lets light shine in while maintaining a bit of privacy, and grommets at the top make hanging easy. Available in two colors and two lengths. Machine washable. Panels sold individually. Polyester; imported. Choose: Turquoise or Yellow. 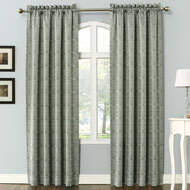 Available in: 63" Panel (52" x 63") or 84" Panel (52" x 84"). 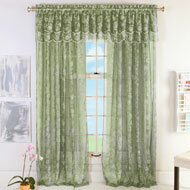 Instantly add designer style to your home with this beautiful curtain panel. Featuring a lovely wave tile pattern, the energyefficient and roomdarkening panels are available in two colors and two lengths, each with a rod pocket top for easy hanging. Panels sold individually. Machine wash. Polyester; imported. Choose: Natural or Blue. 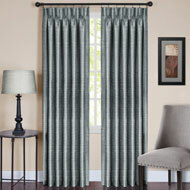 Available in: 63"L x 54"W, or 84"L x 54"W.
These classic pinch pleat drapes with an elegant striped woven texture add timeless sophistication to your home décor. 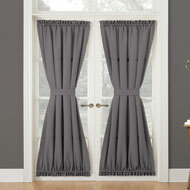 The beautiful curtains come in 2 sizes and 3 colors, and have 3 options for hanging; use clip rings, pin hooks or back tabs which work on a standard curtain rod. Panels sold individually. Machine wash. Polyester; imported. Choose: Spice, Slate Blue or Ivory. Available in 34" x 63" or 34" x 84". Sold individually. 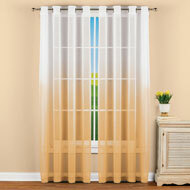 A beautiful design in your choice of gold or silver makes this sheer curtain panel the perfect way to frame your view. 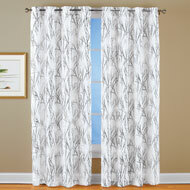 The metallic branch design is featured atop a white background, and the sheer fabric lets light in while providing a bit of privacy. Panels sold individually. Machine washable polyester; imported. 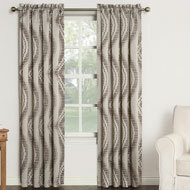 Available in two lengths: 63"L x 52"W or 84"L x 52"W. Color available in Silver or Gold. This stylish door panel fits patio and French doors perfectly, allowing light to come through while still providing some privacy. 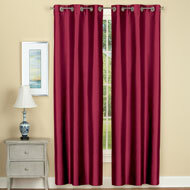 Available in 4 lovely colors, the panels have rod pocket tops and bottoms for easy hanging, tie back included. Machine wash. Polyester; imported. 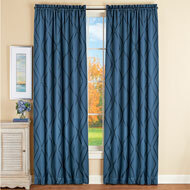 Each panel is 72"L x 48"W. Choose Chocolate, Navy, Nickel or Taupe. 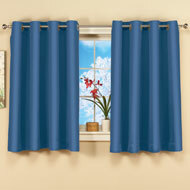 With a stylish and beautiful allover leafy fern and floral design, this lovely curtain panel will give your window instant designer appeal. 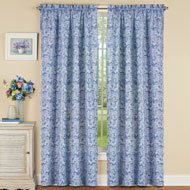 Available in 3 colors with white leaves, each curtain panel has grommets at the top for easy hanging. Available in two lengths. Machine wash. Panels sold individually. Polyester. Imported. Color available in Grey, Light Blue or Sand. Size available in 63" Panel (63"L x 42"W) or 84" Panel (84"L x 42"W). 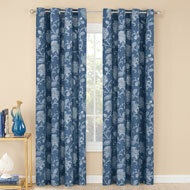 These beautiful panels frame your windows with colorful style. 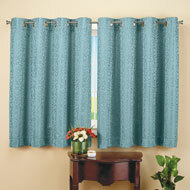 Available in 4 lovely colors, the panels have grommets at the top for easy hanging. Machine wash. Sold individually. Polyester; imported. Colors available in Brick, Stone, Chocolate or Taupe. Sizes available in a 63" Panel (54"W x 63"L) or a 84" Panel (54"W x 84"L). 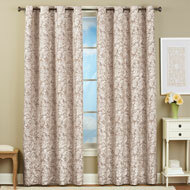 Now you can frame your window with rich texture and timeless style. 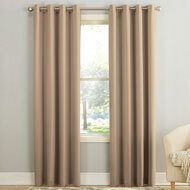 Available in two lovely colors, this faux suede curtain panel has grommets at the top for easy hanging. Machine wash. Panels sold individually. Polyester; imported. Color available in Tan or Chocolate. Size available in 63" Panel or 84" Panel. 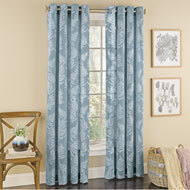 With a stylish and beautiful woven fern design, this lovely curtain panel will give your window instant designer appeal. 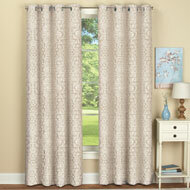 Available in two colors with white ferns, each curtain panel has grommets at the top for easy hanging. Available in two lengths. Machine wash. Panels sold individually. Polyester; imported. Choose Sand or Fern. 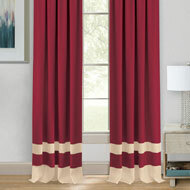 Available in two sizes: 52"W x 63"L or 52"W x 84"L.
With a lovely linenlike texture and charming pompom accents, these curtain panels dress your windows in designer style. Rod pocket tops for easy hanging. 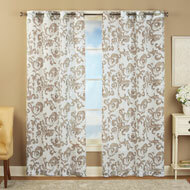 Panels available in two lengths. 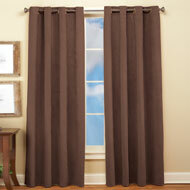 Each panel sold individually. Machine wash. Polyester; imported. Colors available in Linen, Aqua or Grey. Sizes available in 63"L x 52"W or 84"L x 52"W.